The Solway Yacht Club offers a cordial invitation to visiting sailors. The Solway Yacht Club offers drying out pontoon berths for approximately 6 yachts at £15 per night payable at the Mariner Hotel at the head of the pier. 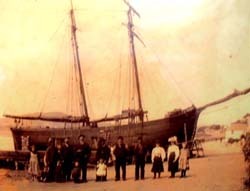 However, Kippford is not really a suitable berthing area for Fin Keelers as there are no deep water moorings. Additionally, the Club ask fin keelers not to 'tie up' onto the pontoons as they put too much pressure on the structure and cause damage. Both Cruiser and Dinghy visitors can have access to the Clubhouse for showers and toilets. WiFi is available in the Clubhouse free. The WiFi is with BT so a BT Open Zone is available for BT Broadband customers. Ask the Hon Sec for the pass codes for the Clubhouse and WiFi when you book. There are water and electricity points on the pier and pontoons. Kippford has a well equipped chandlers at the Kippford Slipway. A bus service calls at the village and stops at the shelter in the village opposite the Chandlers. The Kippford Caravan Park (up the hill on the way out of the village) provides a seasonal shop with a wide range of fresh foods, newspapers etc. It also has cycle hire. Adjacent to the Caravan Park is a Golf Course which welcomes visitors. 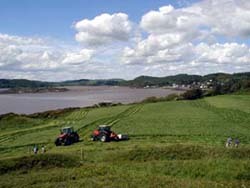 Kippford has two hostelries, the Anchor and the Mariner both of which do bar meals. 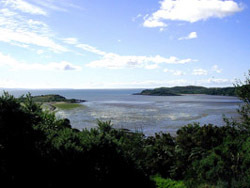 There are some spectacular walks from the village and the Jubilee Path between Kippford to Rockcliffe is publicised as one of Scotland's best. 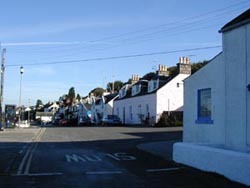 There is the Rockcliffe Gallery in the Barons Craig Hotel and a tea shop in Rockcliffe, on the left, just where the road leaves the village. The path along the shore from Rockcliffe to Castle Point will not disappoint. Solway Smuggling - during the 18th century the Solway was one of the most prolific smuggling areas in the country, particularly, with the independence of the Isle of Man and the numerous creeks, coves and caves, between Southerness and Fleet. The link will take you a summary of smugglers tales.